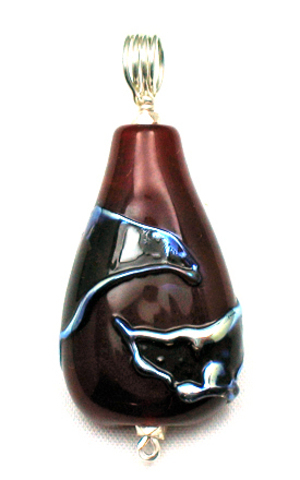 This flat teardrop shaped lampworked bead was made with a base of semi-transparent red glass that was decorated with shards of glass that have a high silver content. The bead was shaped and flattened and then the shards were applied with tweezers and melted in. The result is a wonderful patterning of silver outlines with subtle tones of blue.